It might seem that Carcharodon carcharias choose seals and sea lions as their preferred prey, but studies indicate that great white sharks consume different prey based upon their age, size and location. When they are juveniles, they seek out a wider variety of foods before culminating into the more well-known options. Scientists published their findings in the journal PLoS ONE. Sora Kim, from the University of Wyoming and colleagues, used chemical clues in great white shark vertebrae to track the different feeding preferences among individuals, between 1957 and 2000. This technique has been used previously to outline the diet of other creatures. As animals feed, chemical tracers in the form of carbon and nitrogen isotopes are incorporated into their teeth and bones. There is a correspondence between certain carbon isotope ratios and particular food sources. Once they are matched, researchers can reconstruct an animal’s diet. 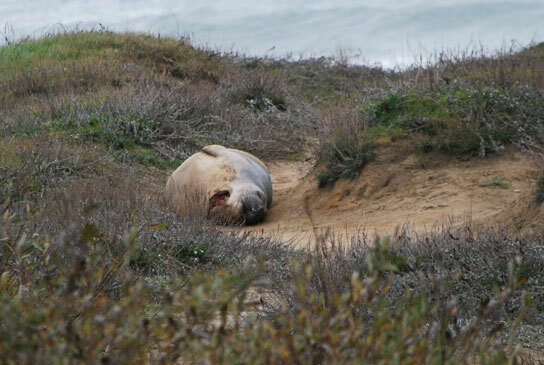 A shark-bitten elephant seal rests on an Año Nuevo State Park Beach. Photo by Brian Switek. Shark vertebrae contain long-running records of these isotopes. The vertebrae of great white sharks accrete new rings on a yearly schedule as they grow. Each ring holds a chemical snapshot from a year in the life of the shark. This has allowed researchers to track the diets of individual sharks during their lives. Contrary to assertions that pinnipeds are a great white shark staple food, the sharks sampled in this study showed a highly variable diet. Some sharks showed no difference between juvenile and adult diets; but others showed large variations, shifting from a diet of fish and small prey to marine mammals and other more substantial fare at about age four. Many of the Pacific great white sharks sampled were generalists who took varying prey in different locations. Some preferred marine mammals located near shore, but others were more flexible in their foraging approaches. This study raises new questions about the biology of the great white shark. 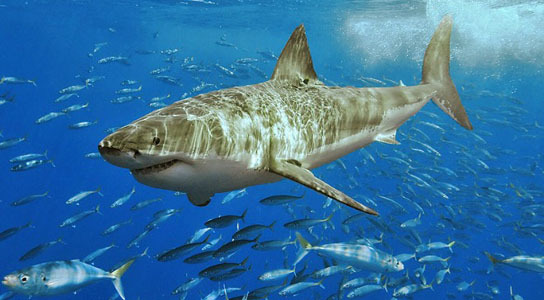 Competition could be the key on determining the individual diets of sharks. By being flexible with their diets, great white sharks may lessen competition with their own kind. Further isotopic studies and satellite tracking programs are needed to help marine biologists better understand the great white shark. Be the first to comment on "Great White Shark Have a More Varied Diet Than Previously Thought"